Hey there; it’s been three weeks since my last review. Here is the surprise for any of you who’d been wondering (and hadn’t already noticed): the series I was researching was Touhou, and I spent that time playing every, watching every, and reading the scripts of every Windows game in the series (along with consuming other information). I wasn’t about to talk about any of the manga in the series without knowing about it first. Touhou Suzunaan ~ Forbidden Scrollery (東方鈴奈庵　～ Forbidden Scrollery.) 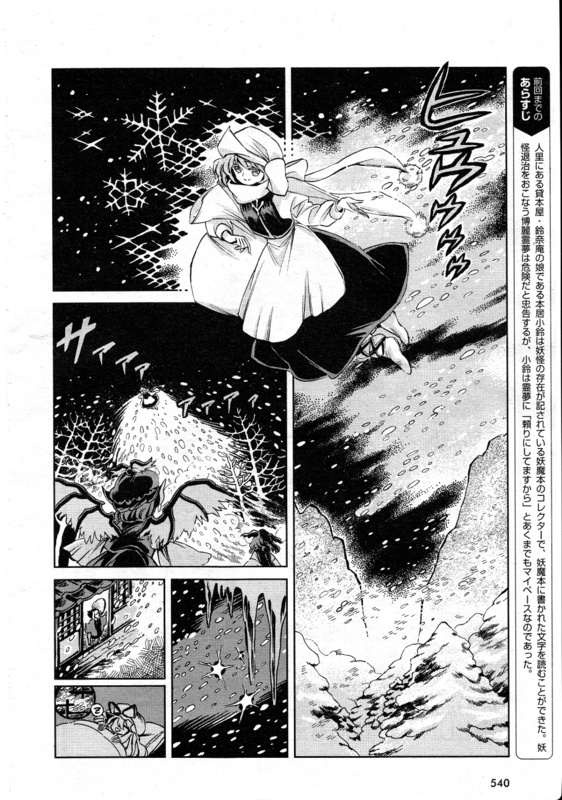 is a manga set within the “Touhou Project” universe written by ZUN, the series’ creator, and drawn by Harukawa Moe (春河もえ). Touhou is a series of bullet hell shooters (and some fighting games), 24 entries strong, and with its mainline titles (and some spinoffs) entirely created by ZUN from art, to music, to gameplay, to writing and all that. The series is quite the phenomenon in Japan, though the series’ creator’s desire to always make canon parts of it somewhat by his own hands means for all its popularity it has no official anime series or anything like that which would make him very rich. Something he can work on with his own hands, however, is manga. 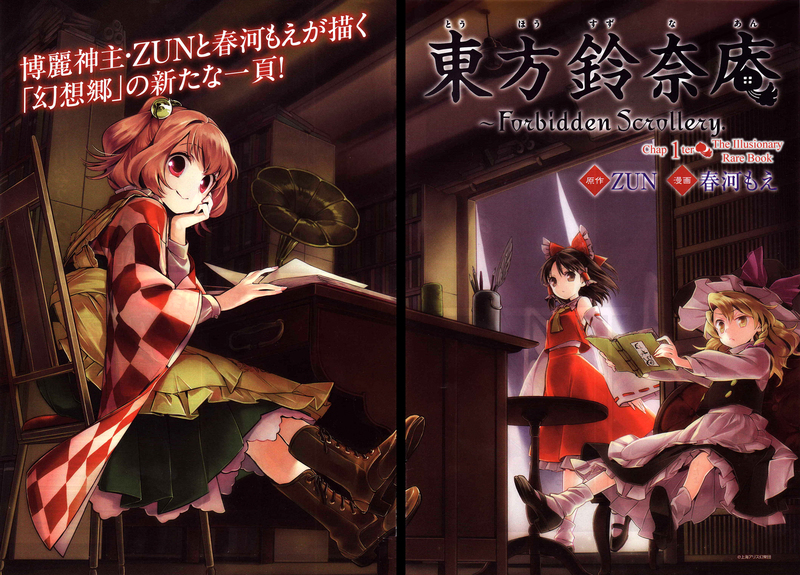 Forbidden Scrollery is one of three manga ZUN currently has ongoing, the other two being a new Touhou Sangetsusei manga (a series of manga focusing on the same three characters), and Touhou Ibarakasen ~ Wild and Horned Hermit. I will be reviewing those other two this week, and will of course start today with Forbidden Scrollery (followed by Sangetsusei and then Wild and Horned Hermit). 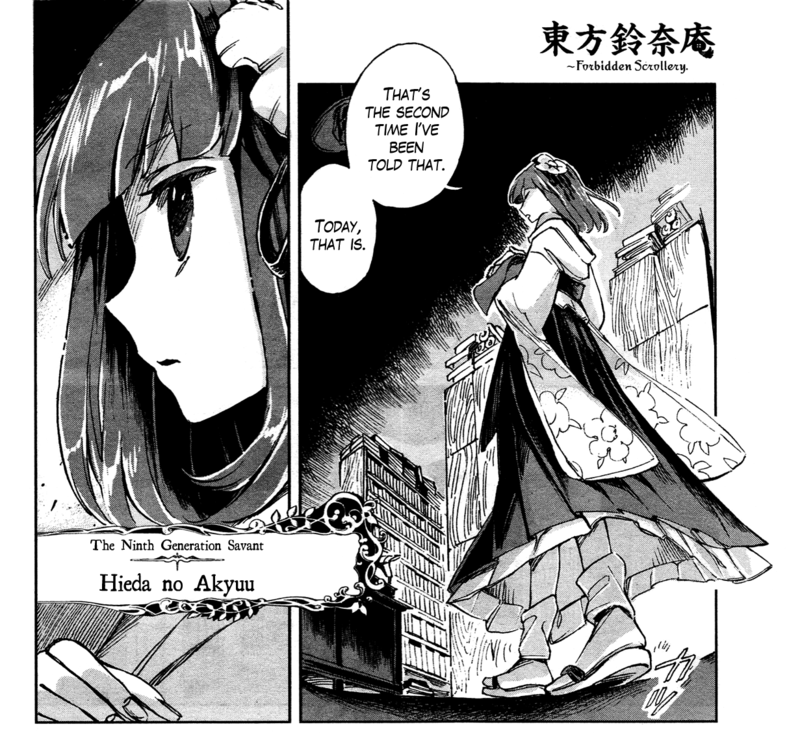 Compared to the other two, I would argue it is the “least Touhou” of the Touhou manga. Surprisingly, this isn’t a bad thing. Actually, I’d say that this is the best of ZUN’s manga. I’ll be making an argument as to why I think the series is as it is later. 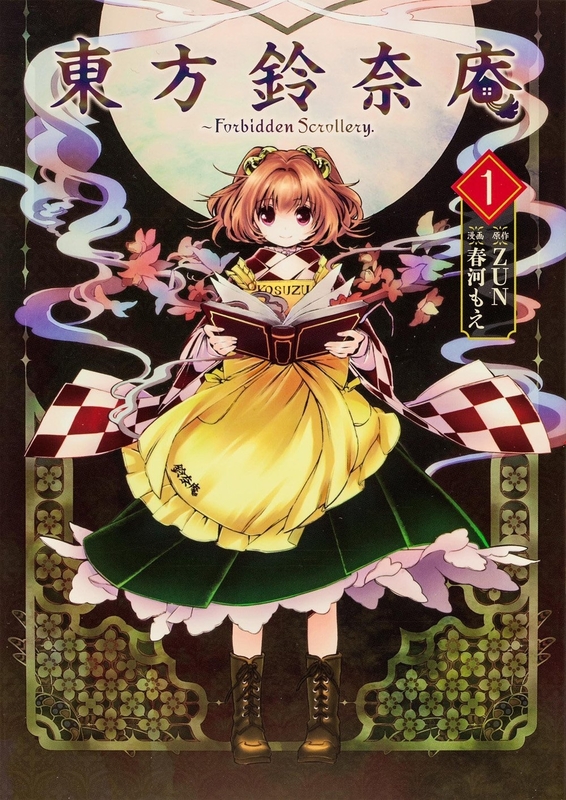 Before that, if you want my basic impressions, I think Forbidden Scrollery is a thoroughly interesting, well-thought-out series with absolutely beautiful artwork that flawlessly captures the fantastic picture and atmosphere of Gensoukyou, Touhou’s setting. It is a marvelous little episodic mystery series as well as a looming tragedy and it makes me feel disgust reading it. This, in fact, is all praise. It’s been a while, and I have a lot to say. Let’s get cracking. Forbidden Scrollery takes place in an area of the Touhou Universe very, very rarely explored: the Human Village of Gensoukyou. As it says, it is a village of humans, seemingly the only one in the land. This is important but before that, behold above: our protagonist Kosuzu Motoori. She is a young girl who helps run her family’s bookstore/book lending shop, Suzunaan. I would call her cute, but there’s a problem with her, a big problem that has to do with the way this land works. Gensoukyou is not a land of humans, it is a land magical beings (such as fairies), spirits (such as phantoms), and of youkai (monsters, basically, and of all kinds both Eastern and Western in this setting) — the lattermost the most present. It is a fantastical and sprawling land akin to ancient Japan, cut off from the Outside World (which is our world as we know it) by a barrier that sometimes lets items or people slip through. Otherwise, to humans living in Gensoukyou, Gensoukyou is the Human Village, which is a very, very small part of this place which spans from Hell to Heaven and queer pockets between. If they venture outside much, they risk being attacked by youkai, which subsist off of the fear humans emit from seeing and knowing of them. That, or they quite literally feed on humans by eating them. Youkai are almost universally dangerous, and there are means to deal with them, but for reasons that you may not understand, Youkai need to torment humans, and humans need to be afraid. There is a precarious equilibrium in Gensouykou keeping it at peace, but… Well, let’s return to Kosuzu now. Kosuzu is a reader stand-in. 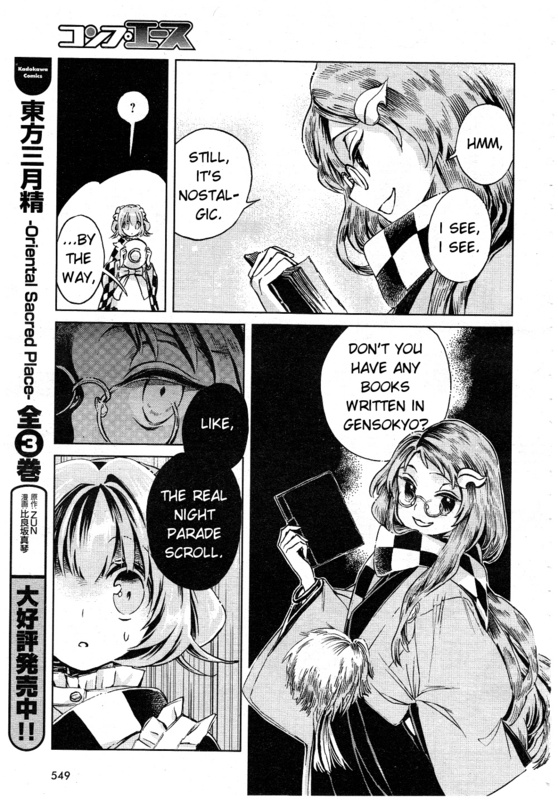 Whether you are or aren’t familiar with Touhou, reading this manga means you are going into something new and unknown by virtue of the setting being the Human Village of Gensoukyou (only somewhat vaguely explored previously in another work, Perfect Memento in Strict Sense). In some ways, it may actually help to be on the side of the unfamiliar with this series, considering Kosuzu herself only has the barest understanding of how her own world works. To Kosuzu who only knows the Human Village, the things outside it sound rather enticing. Not the violence or the death, of course, but the unrelenting fantasy of it all. Naturally, as a bookstore proprietor, the best way to experience that is going to be through books for her. Now here’s where the problem is and half the core of Forbidden Scrollery lies. Gensoukyou is a world of fantasy, so it’s not unusual for even the humans in it to awaken to supernatural or otherwise magical abilities. Just before the start of the series, Kosuzu awoke to the ability to read any written text (print via machines is also fine) so long as it isn’t intentionally gibberish. She can read books that fall through Gensoukyou’s barrier (called “import” books) in any language from English to Italian and anything else, she can read extremely fancy cursive, and most worryingly she can read the writings of youkai. 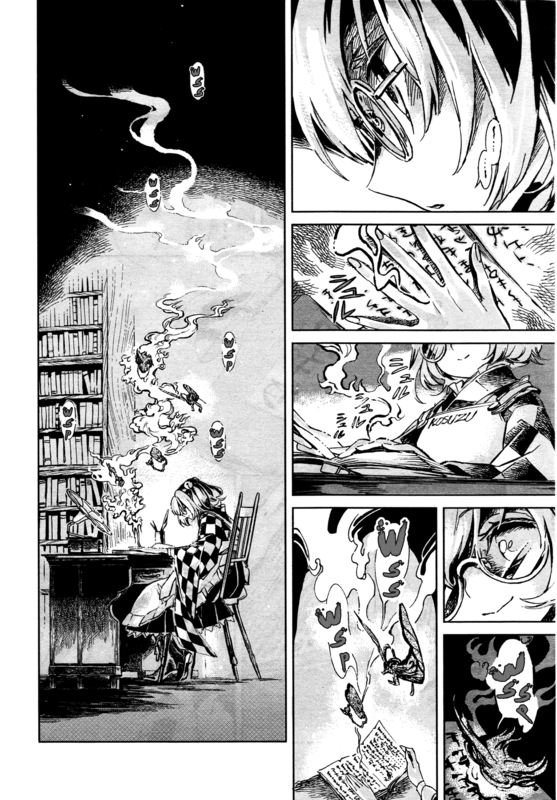 The page this article starts with is of Kosuzu reading a book in such a tongue, from the first chapter. Books like this fascinate Kosuzu (more now that she’s gotten rather bored of import books). They describe a world she will never be a real part of, explore records no human has access to, and she’s a special kind of human who can actually read them. Youkai writings are complete nonsense to anyone other than youkai, after all. And, best of all? It’s very clear that these books have magical power to them. As Kosuzu gathers more youkai writings, she feels like she’s teetering on the brink of that just-out-of-reach fantasy. Well, she’s teetering alright, but she’s not about to fall into fantasy. Kosuzu is right: youkai writings do hold power, but it’s very dangerous and disconcerting power: power to give items consciousness, power to summon dragons, power to corrupt a human and change them into a youkai. 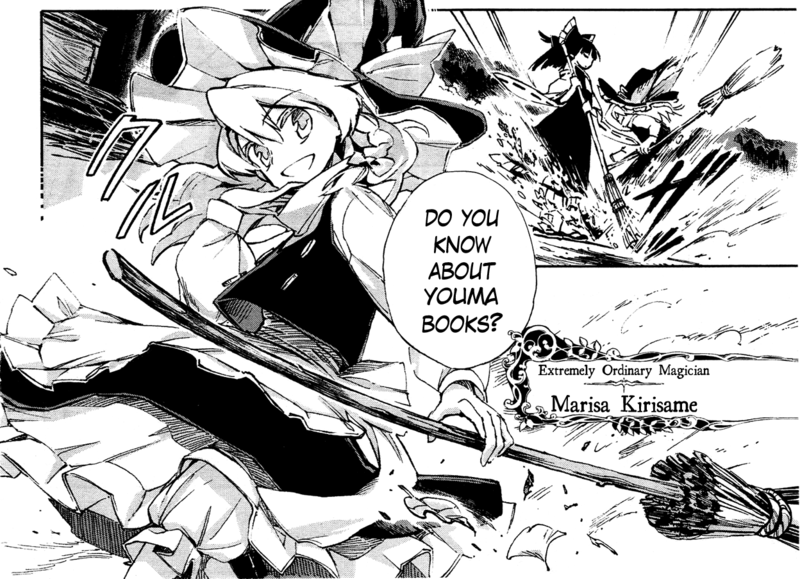 A youkai’s book isn’t called a youkai book, but a “youma” book. Youkai, as much as I spread doom and gloom about them, can be either bad or good. Youma are bad. The word “youma” refers to definitely evil monsters that may be courted into reality as the writings sealing them are read. And thus we have the ever present concern of Forbidden Scrollery. The series has a very appropriate title. Kosuzu, unable to really understand the dangers of her exploits, continues to read and collect youma books out of a thirst for knowledge. 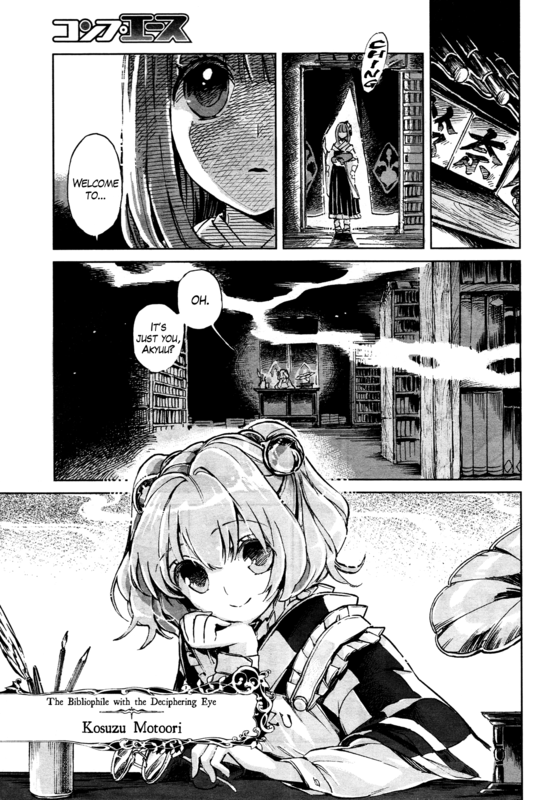 Kosuzu does fear youkai, but the more she reads about them the more she feels she can sympathize with them. These are horrible, troubling ideas to breed in the Human Village. Thankfully, Kosuzu isn’t alone. It’s time to transition slowly into the next half of the series’ core, which ties with the first. The person above injecting sense into Kosuzu’s head is her best friend, Hieda no Akyuu. Miss Akyuu is another special kind of human — in her case a kind of soul that reincarnates after every one of its short lives comes to an end, able to retain all of her memories in life and after death/reincarnation. She remembers back to over 1200 years ago, and each of her incarnations is responsible for chronicling Gensoukyou. In fact, Akyuu is the author of Perfect Memento in Strict Sense (and another, Symposium of Post-mysticism) which ZUN has so graciously provided to the Outside World. 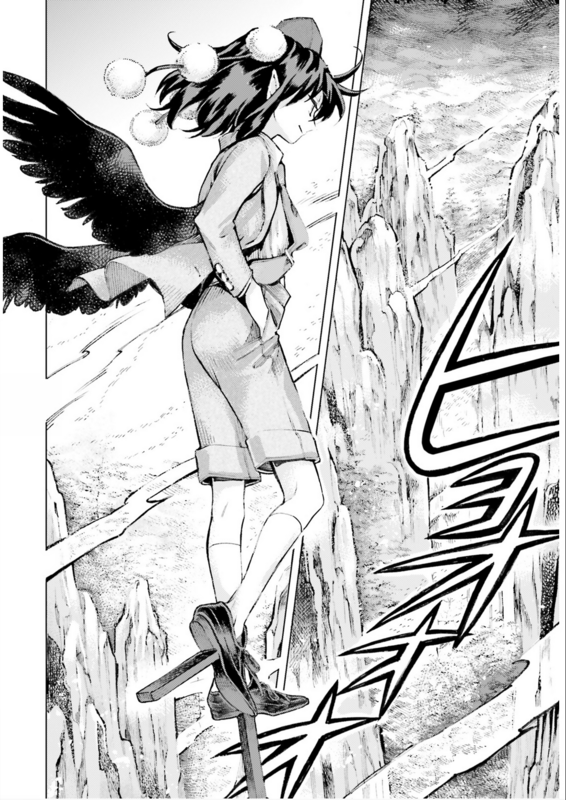 Being so “old”, knowing the importance of humanity and surely the terror of youkai, Akyuu holds a firm “human” stance, largely unwavering in her mostly negative opinions of youkai. She looks at Kosuzu, clearly walking down a dark path, and tries to firmly steer her away from most anything youkai-related. On the opposite end of the spectrum we have Mamizou Futatsuiwa, a tanuki who’s strongly pro-“youkai”. 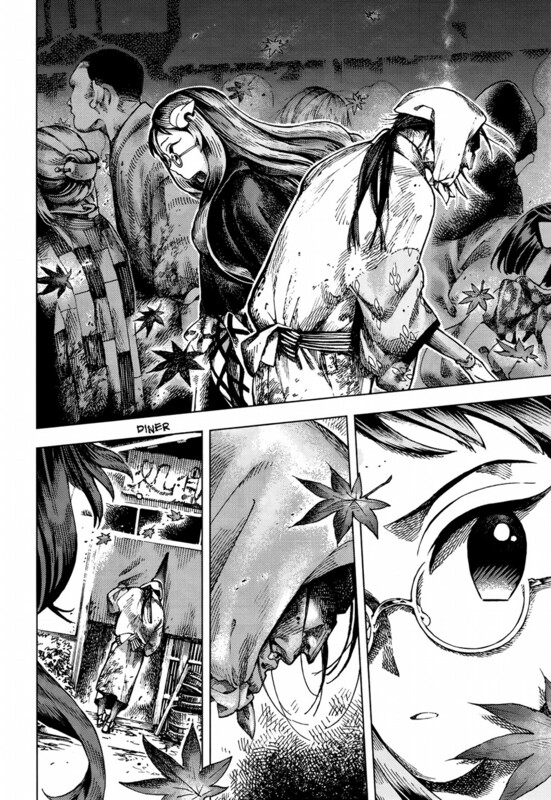 One of the things tanuki are best known for is transforming their appearance (Mamizou being one of the best where she hails from), and the above page featuring Mamizou is featuring her in the guise of a human, one she always takes whenever wandering the village or speaking with Kosuzu (not that her real looks are much different). Kosuzu quickly becomes infatuated with the mysterious old youkai’s manners and nature, aware that the older woman is special, but not certain why. 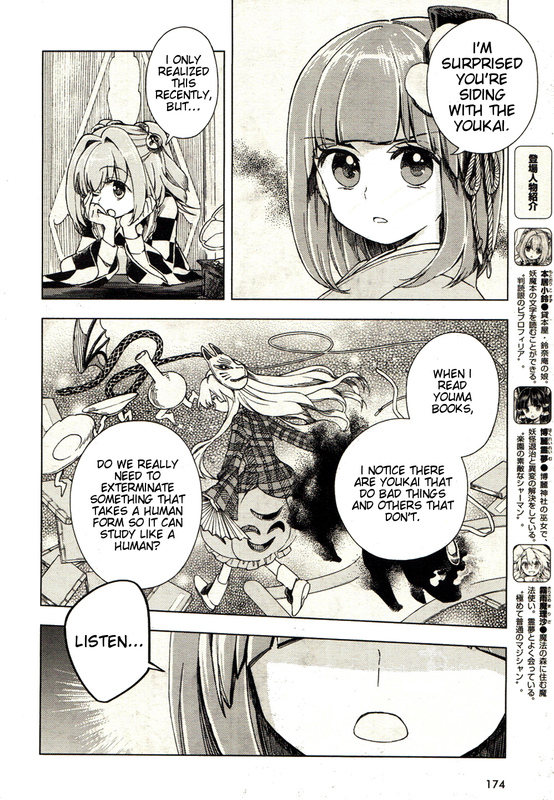 Mamizou appeals to Kosuzu by selling her import books and giving her advice about youma books and youkai in general. 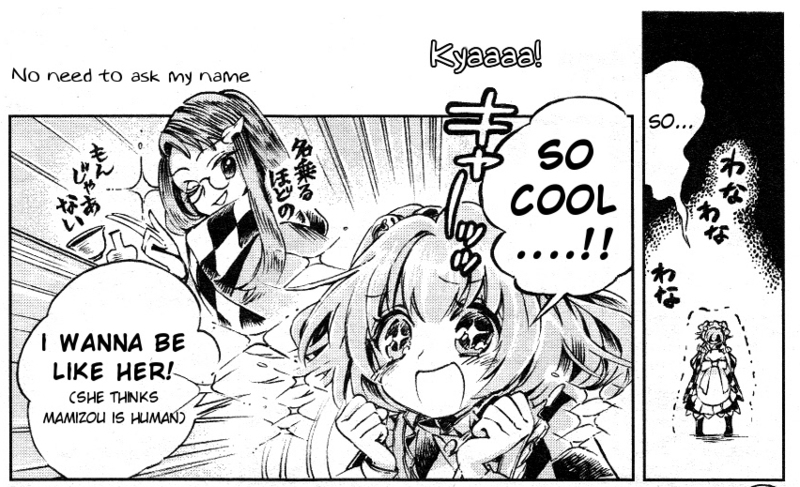 Mamizou seems to like Kosuzu as well, but more importantly she likes Suzunaan. More on that later. And lastly, we have the two in-between, the heroines of the game series: Reimu Hakurei and Marisa Kirisame. The two are human like Akyuu, but don’t live in the Human Village (Marisa living in a forest of magic after having left the village, Reimu seems to have always lived in a shrine up on the hill that humans visit extremely rarely); they’re friends with quite a few youkai, but they mainly deal in exterminating/punishing youkai. The truth is, though Marisa tends to not show it as much since she’s the “excitable, puppy-like” heroine, both of them just want Gensoukyou to remain at the kind of peace it currently stands in. 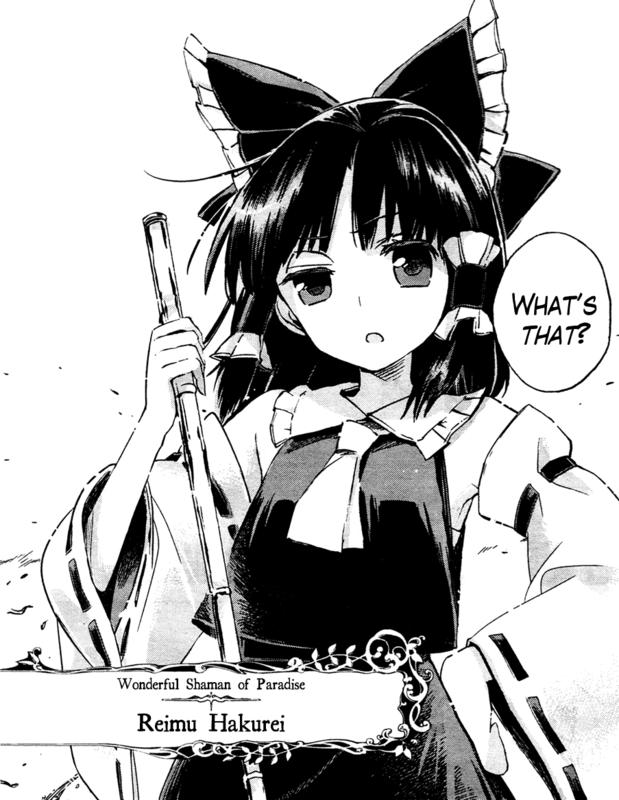 Reimu especially, as it’s literally her job and duty to protect Gensoukyou (she’s a shrine maiden, after all). You may find it hard to believe, but the two of them are “neutral”. 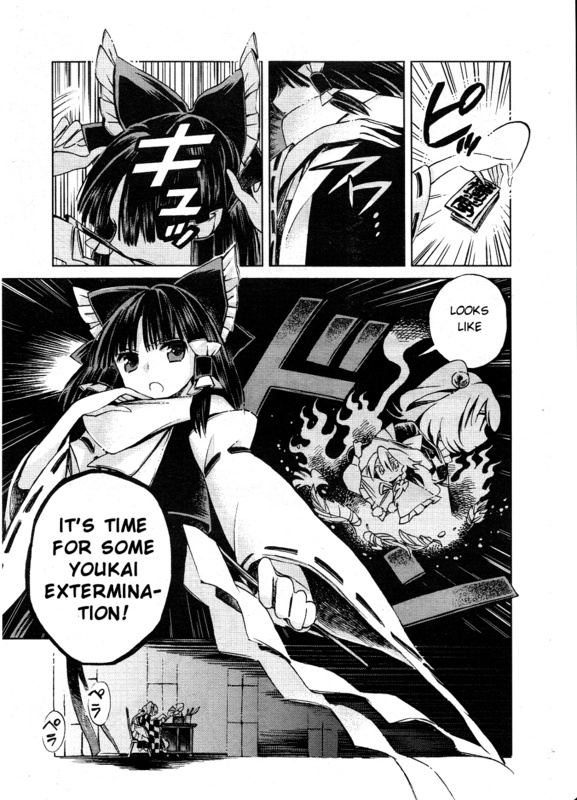 Marisa will fiddle with dangerous items, Reimu will turn a blind eye to “harmless” youkai, both will take care of anything that threatens the balance of the Human Village and therefore Gensoukyou as a whole. As with the rest of the series, whether or not things turn out well in the end is probably going to be due to one or both of these girls acting. And so: the second half! 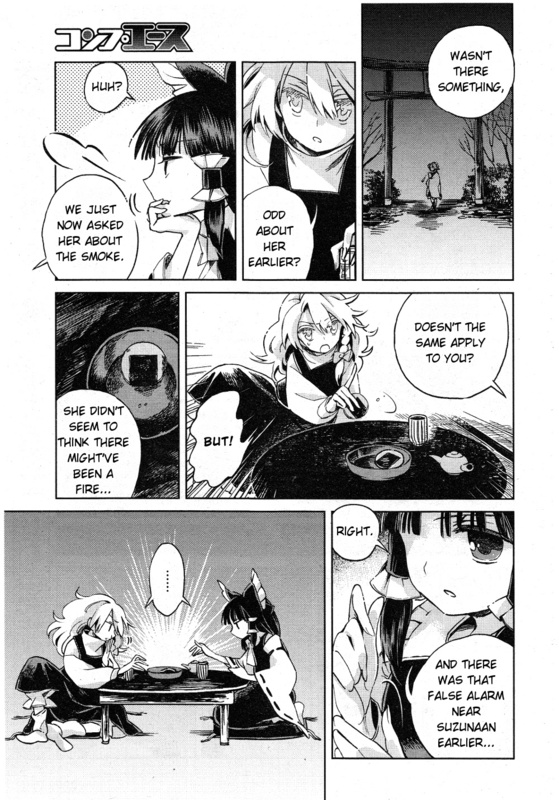 While Forbidden Scrollery is always about subtle power struggles and select exercising of influence mainly focusing on the book store Suzunaan, it’s also about Reimu and Marisa (and sometimes Mamizou, Akyuu, or even Kosuzu) looking into and resolving strange occurrences within and around the Human Village. Often these occurrences are the work of youkai trying to increase their species’ power by remaining within the humans’ consciousness prominently… Or it’s all just to screw with humans. If it’s not youkai, it’s Suzunaan’s youma books acting up and causing trouble. Again, the title is appropriate. 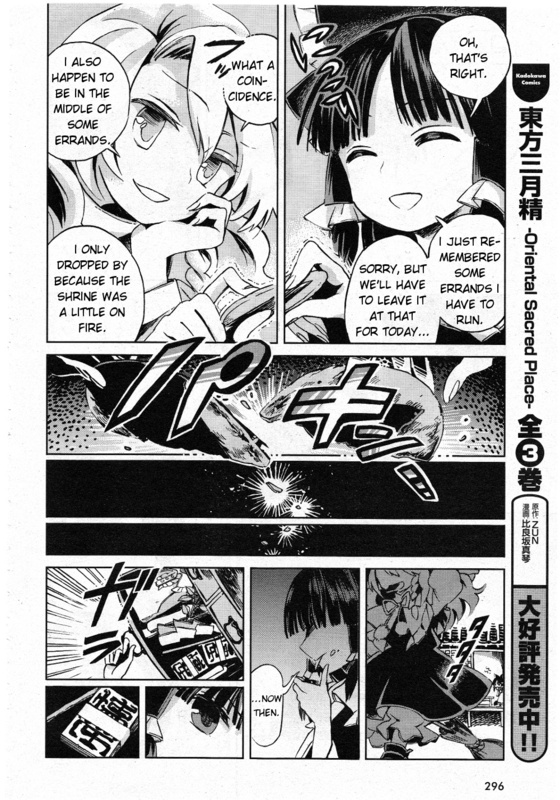 Touhou Suzunaan directly refers to the book store, and all eyes at play are on that book store. The human supporters see it as potentially very dangerous, the youkai supporters see it as a useful haven, and the neutrals are just watching, not sure what to make of it. The title of this series makes it different from the other two ongoing manga, Sangetsusei (lit. Three Fairies) and Ibarakasen, which focus on the protagonists — the Three Fairies of Light and Ibara Kasen, respectively — almost entirely. This difference makes it feel unique, and along with the other ways the series feels mysterious and new, I wouldn’t be surprised if this series was an entry point into Touhou for quite a few people (the magazine it runs in, Comp Ace, is pretty poplar). I don’t think I’d mind that, because although the series is definitely better knowing the games’ stories (and some other material, like Perfect Memento in Strict Sense), this manga is a little delight all on its own. Having done this dance so many times, Marisa and Reimu like to make a competition out of who can resolve a problem first. Whether you know these characters or not, they’re so expressive and alive that you can get what every one of their deals is very quickly. The series’ ordinary flow of progression is having a “part 1 ” chapter that sets up the basis for a small incident, then a “part 2” follows wrapping things up often nicely. 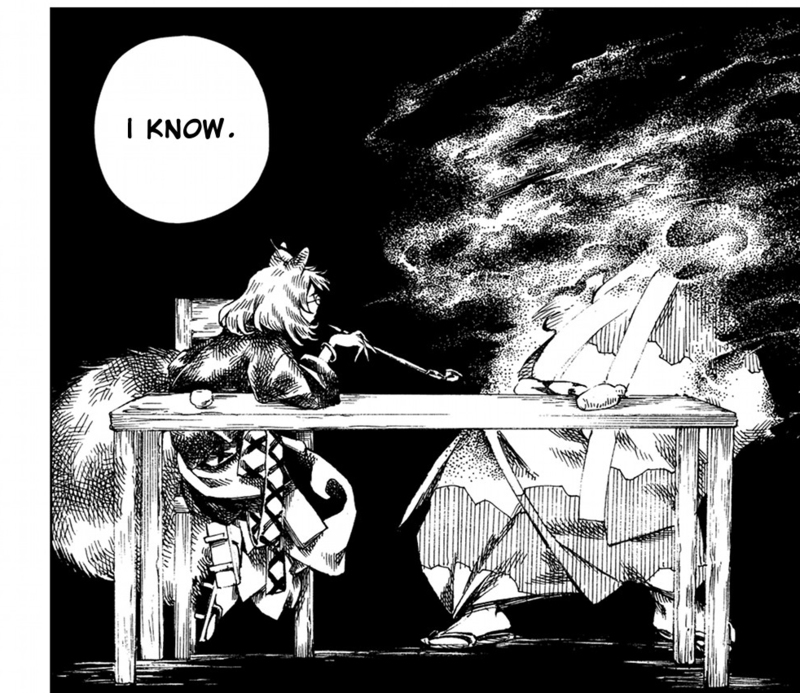 Though they’re not the “main characters” here, it’s mostly Marisa and Reimu figuring things out and then dealing with it. Although the games are full of it, there isn’t a lot of fighting in Forbidden Scrollery. 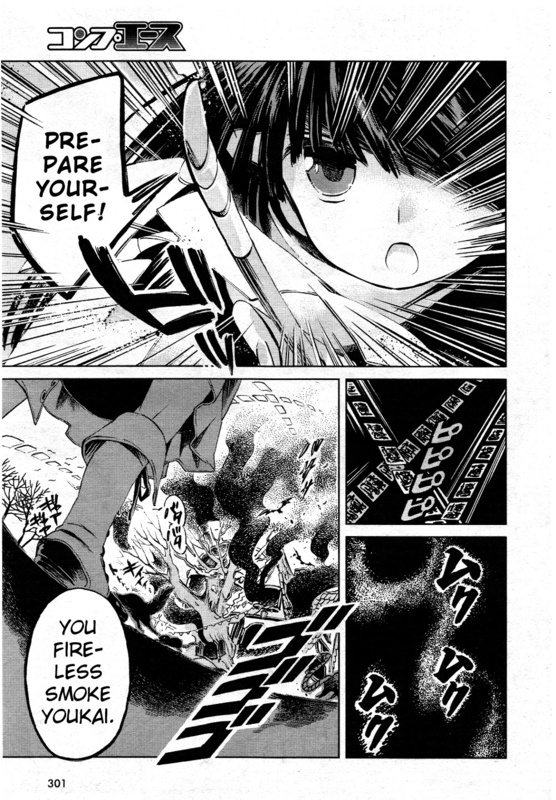 Instead, the manga focuses on rising tension and quick flourishes of action. When things aren’t blowing up with magic bullets and spiritual seals, which is most of the time, the reader is treated to lots and lots of mythology, and challenged to see what youkai and/or what scheme is at hand before the heroines figure it out and get to work. Simple, episodic mystery. Always nice. 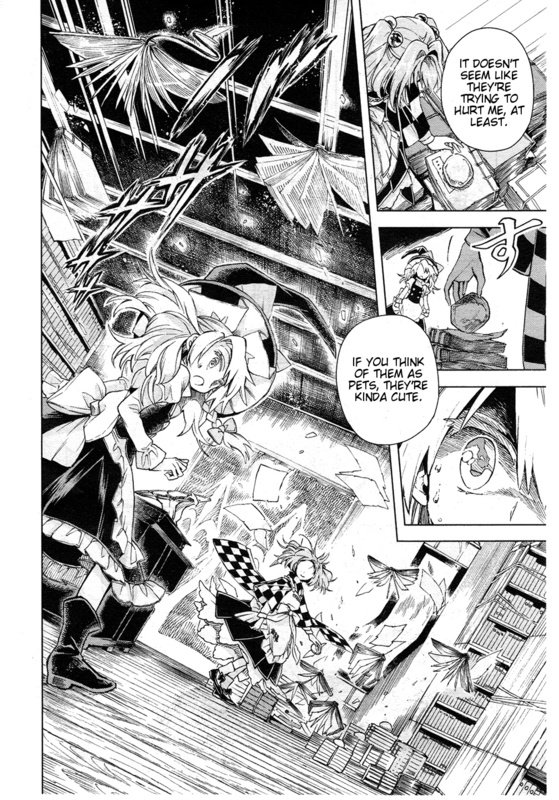 Unlike ZUN’s two other manga, Forbidden Scrollery is really light on full cameo appearances from Touhou’s very, very immense cast. You’re likely to see some characters players would recognize flitting about here or there at a festival or some such but not often do characters outside of the main cast of Forbidden Scrollery get speaking roles, and even if they do there isn’t too much you would gain from knowing their backstories. This isn’t a “fanservice” series, but very much a focused story, and anyone who comes into it and actually gets to talk is going to play an important part. ZUN makes everyone’s character quickly clear — unsurprising, since that’s how it works with most of the games’ bosses. Honestly, I feel like he might have written this manga assuming newcomers would read it. This is why I think its “least Touhou-ness” is probably a good thing. Most of Touhou is very chill, with characters ribbing each other before and after they fight with danmaku (that is, waves of bullets in beautiful patterns). Occasionally it can feel a little dark, but Forbidden Scrollery often feels dark. 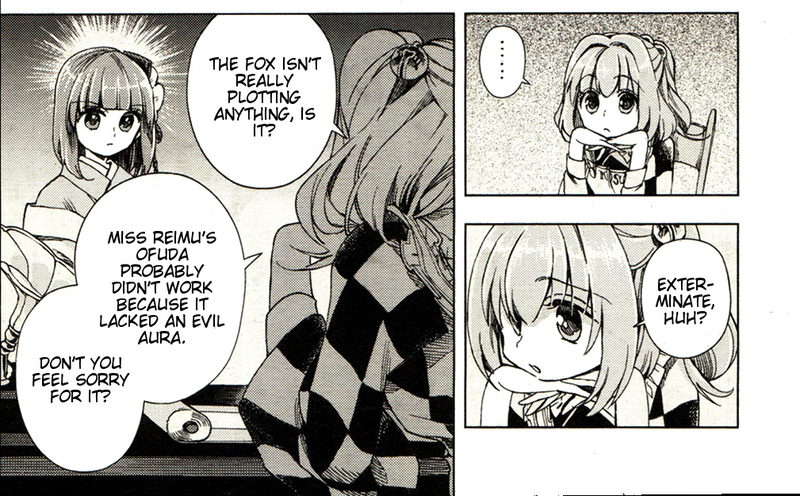 Aside from Kosuzu’s “stare into the Abyss” leanings, the biggest reason for that darkness is Mamizou. Mamizou is an extra stage boss (basically, a boss you can fight after beating the game) from “Touhou 13: Touhou Shinreibyou ~ Ten Desires”, and extra stage bosses have a long history of not being particularly important. They’re characters either hinted at or just tangentially related to whatever happened in the main game. Two really big exceptions come to my mind with extra bosses. 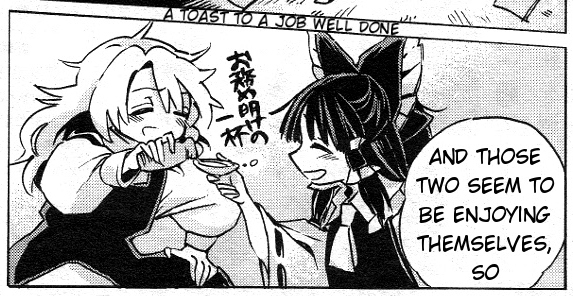 One is Yukari Yakumo, who surprisingly is not a real cast member in Forbidden Scrollery, and the other is Mamizou. 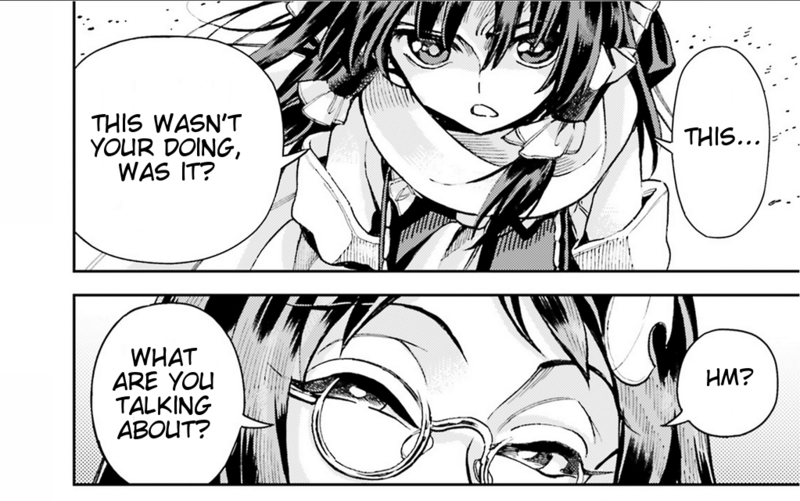 Mamizou has been asserting her new importance ever since she entered Gensoukyou and nowhere is that clearer than in Forbidden Scrollery, in which she is undoubtedly a main character. Who knows! Read the manga and come up with your own theories. 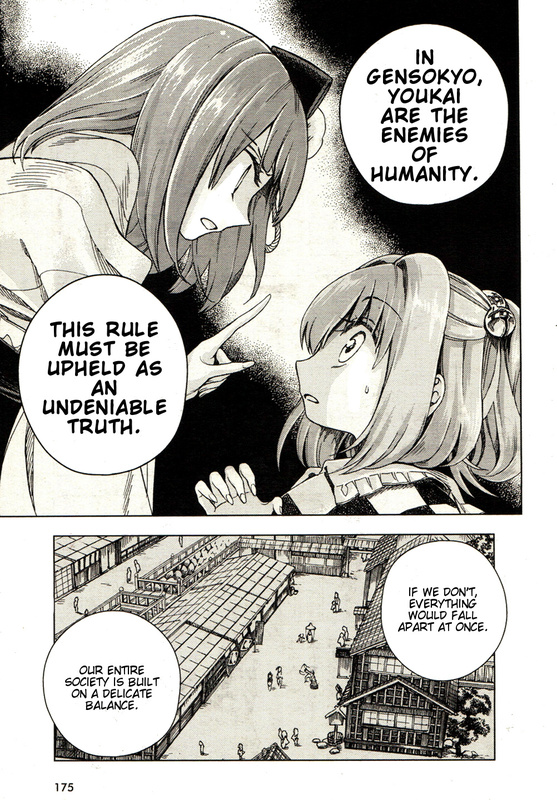 Touhou Suzunaan ~ Forbidden Scrollery is just a goddamn great manga. I went into it expecting a relaxing, wonderful time in Gensoukyou. I did not get that, but I’m glad. What I got was a thought-provoking tale based on the very simple ideas of balance, peace, and temptation. You could likely enjoy this series a lot without any knowledge of the Touhou games, but I don’t think that’s enough. Do yourself a favor and play the Touhou games (also, read Perfect Memento in Strict Sense while you’re at it). There’s at least like four whole other layers of quiet Gensoukyou politics you’ll be missing otherwise, along with some character development, motivations, and so on. Touhou Suzunaan is not Touhou proper, so don’t let it confuse your expectations. Plus, the games are fantastic games! I don’t usually talk about art very much but oh my god, I have to laud Harukawa Moe for her work on Forbidden Scrollery. Forbidden Scrollery is a gorgeous series. It’s beautiful. It’s a blend of soft and sharp with adorable but also cool looking character art that’s flowing and magical. The environments are so detailed and pretty. Harukawa’s grasp on facial expressions is also top notch, meaning you can get anything from barely contained resentment portrayed to lovable faces of shock. I truthfully think Harukawa Moe’s vision of Gensoukyou is a true one. She’s actually gone on to do the official character portraits for “Touhou 14.5: Touhou Shinpiroku ~ Urban Legend in Limbo” (here’s a screen), so I really hope we see more of her in this franchise! That’s enough praise, no? If you’re already a Touhou fan, you should be reading this. If you’re not, consider this one of the several things you can look forward to after you experience the video game series. The author and artist of this fine piece of work did a truly wondrous job. Up next is Touhou Sangetsusei, all of it. It’s a much, much more lighthearted series. In fact, it’s silly. See you Wednesday, and thanks for reading. And hey, how’s about some Touhou music? First off, I want to say thank you for introducing me to this manga. I’m pretty new to Touhou, and I tried to play the games, but I’m still stuck in EOSD (Sakuya’s too hard for me, haha). I read your first article about it today and then stumbled onto this article, and seeing how I had nothing better to do, read Touhou Forbidden Scrollery. …It was amazing! Just like you said, the artwork was gorgeous and the thought-provoking messages were really great! I read all of it in one sitting today, and I can’t wait for new chapters already. Thats why I wanted to say thank you and also eagerly await your reviews on the other two manga’s (which I’ll read right after finishing this comment). Another thanks for giving me more Touhou music to listen to. No problem, no problem. I’m quite happy you enjoyed what you read so much! Regarding EoSD, remember you can always move on to the next game and return to EoSD some day when your skills are better. Very Good Review! Glad that you are liking Touhou. 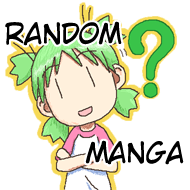 And very good site, I would probably end up reading most of your reviews :D.
I hope you would review Bokura no Kiseki one day, its one of the best/underrated on ongoing manga. I actually hadn’t heard of Bokura no Kiseki. I’ll look into it.